In April of 2013, Pastor Leo described to the congregation a Prayer or Meditation Garden that he had seen at a church he had visited. He voiced a desire that we consider building an area on the Church property, a place where members could sit and be one with Jesus. The image Gethsemane immediately came to mind. 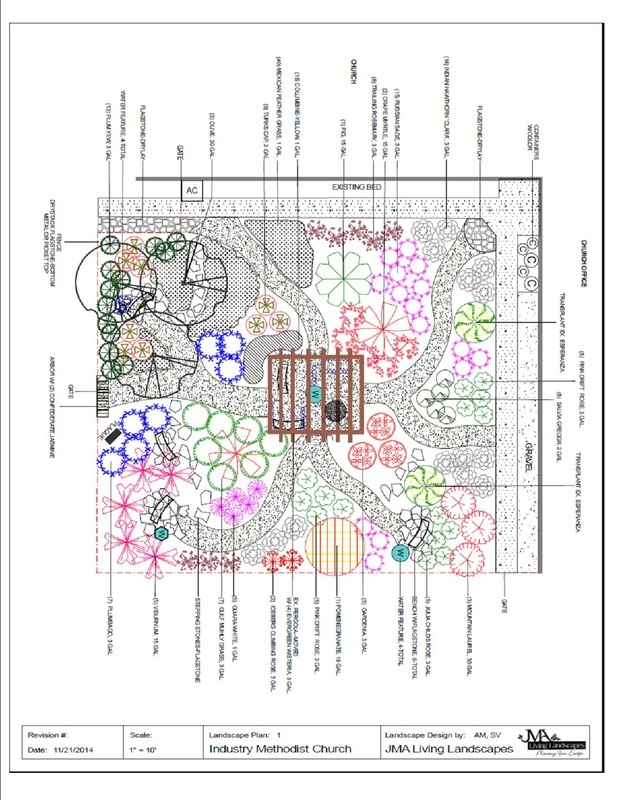 The Prayer Garden Design Committee is requesting consideration by the IUMC Trustees for approval of the design concept as developed by and unanimously approved by the Committee. A description of the projects is shown in a site plan sketch and photographs from the Lady Byrd Johnson Wild Flower Center that are on the wall in the Church Library. The project site is roughly 35’x50’ located at the intersection of the Sanctuary and Classroom wings. It will be fenced and gated with a wood picket fence on a low stone wall. A crushed granite walkway going diagonally across the enclosed area, will connect a covered entry gate and the church office entry. The entry will be improved for handicapped accessibility. Native limestone edges will line the existing concrete walks. The existing electrical service disconnect will be screened by the new fencing. The Prayer Garden will be lighted and can be viewed from parsonage. The design is based on a natural landscape with native plants and flowers and/or biblically inspired plantings such as fig, pomegranate, and grape. They will require minimal watering, but will have an irrigation system. Amenities will include an arbor made of natural cedar timbers/logs with cross vine and wisteria plants. There will be small-group seating provided under the arbor. There will be a natural stone water feature with moving water. Nearby will be a single bench for private contemplation. There have been offers from church members to provide landscape architectural services in plant selection/location, design and construction of the water feature, and Boy Scout labor including Eagle Scout leadership. A dedicated fund has been established for the project. If approved, the next steps will necessarily involve a construction leader to provide cost estimates and to organize/schedule a building team. This concept was approved by the Board and passed to the Administrative Council for final approval. Administrative Council approved the concept and passed it back to the Trustees for development of a workable blue print and estimate of cost for the project. 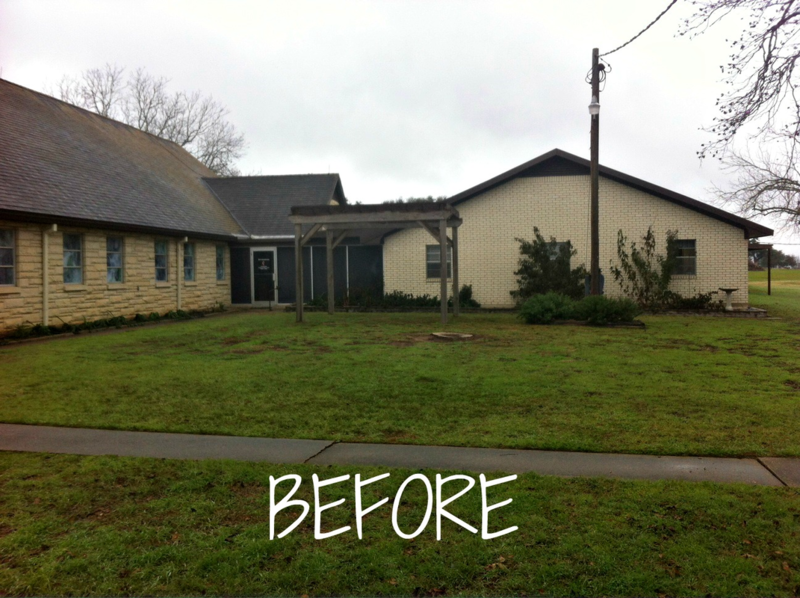 The Board of Trustees hired JMA Landscapes to design the garden based on the desires of the Church Committee. The committee’s description and sketch was made available and members of the Board met with JMA Landscapes and answered questions that they had concerning the materials, layout and location of the garden. By unanimous agreement of the Administrative Council, the Meditation Garden will be dedicated to Esther Spiess. In addition the entrance walkway will be brick. Members will be able to purchase bricks in memory or in honor of the loved ones. In addition, the back of the garden will be the wall of the Education Building. Members will be able to donate monies for the hanging of a plaque in memory of a love one. It has been suggested that members can donate plants as well as benches (there will be three) approved by the committee. Other items are water features, rock border, crushed granite for the walkways, limestone rock borders for the walk way etc. Figure 1 (below) is the layout and plan as developed by JMA Landscapes for the garden. The area that the Garden will encompass is the area to the east of the sanctuary, south of the education building to the front sidewalk (also pictured below). This design and the chart listing material and labor costs will be posted on the Bulletin Board next to the Office work room. As stated, funding for this project will be through memorials and donations from church members. A document listing each component of the Meditation Garden will be listed with the costs in materials and labor for that portion of the total projects. Members are encouraged to consider funding all or part of one or more components in either a monetary donation, purchase of the materials or volunteering the labor toward the project. Work will begin almost immediately. If you have questions please contact Hank Husky, Board of Trustee’s chairman.